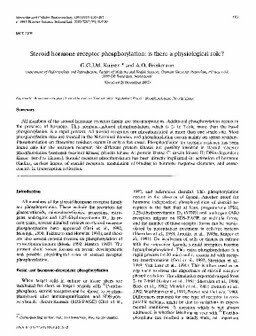 RePub, Erasmus University Repository: Steroid hormone receptor phosphorylation: Is there a physiological role? Steroid hormone receptor phosphorylation: Is there a physiological role? All members of the steroid hormone receptor family are phosphoproteins. Additional phosphorylation occurs in the presence of hormone. This hormone-induced phosphorylation, which is 2- to 7-fold more than the basal phosphorylation, is a rapid process. All steroid receptors are phosphorylated at more than one single site. Most phosphorylation sites are located in the N-terminal domain, and phosphorylation occurs mainly on serine residues. Phosphorylation on threonine residues occurs in only a few cases. Phosphorylation on tyrosine residues has been found only for the estrogen receptor. Six different protein kinases are possibly involved in steroid receptor phosphorylation (estrogen receptor kinase; protein kinase A; protein kinase C; casein kinase II; DNA-dependent kinase; Ser-Pro kinases). Steroid receptor phosphorylation has been directly implicated in: activation of hormone binding, nuclear import of steroid receptors, modulation of binding to hormone response elements, and consequently in transcription activation.